On Monday, September 15th VMware jumpstarted VMworld with VMware Partner Day. Paul Maritz, President and CEO of VMware, and Carl Eschenbach, Executive Vice President of Worldwide Field Operations for VMware, delivered their vision for the partner community. In addition, I learned about regional updates tailored with specific information that impacts your geographical sales initiatives. 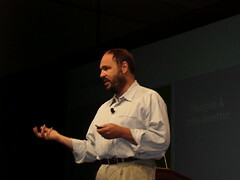 Paul Maritz Kicks Off The VMware Partner Day from Eric Sloof on Vimeo.